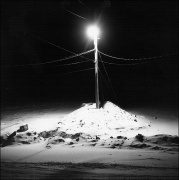 B&W photo essay of Fort Chimo (now Kuujjuaq) in Nunavik (arctic Quebec). 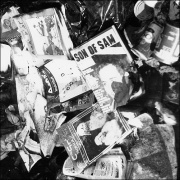 Except for one, all taken with 2¼ twin-lens reflex cameras (scanned from 8x10 prints). 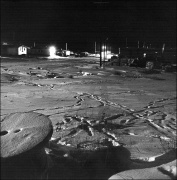 The season of long nights in Fort Chimo. 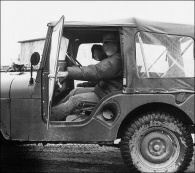 Friends in an old military jeep. Discarded reading material in the Fort Chimo dump. 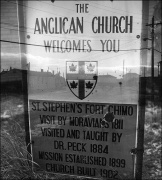 The Anglican Church's long persence in Fort Chimo. 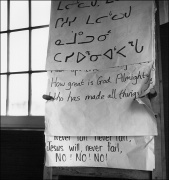 A syllabic prayer in Inuktitut. 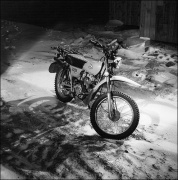 A light for the long nights. 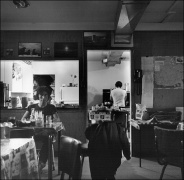 A scene from inside Arctic Traveller's Hotel. It burnt down a short time after this photograph was taken. 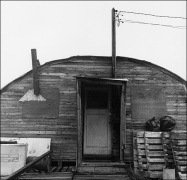 The quintessential quonset hut left over from the military. Arctic Laundry. This photo is actually from a neighbouring community further up the Ungava Coast from Fort Chimo. Web site and all photos © Michael McGoldrick, 2001-2004. All rights reserved.